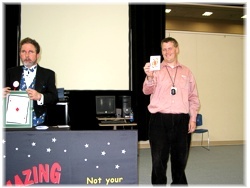 Corporate Magic Shows by Comedy Magician Amazing Jeffo, The Blind Magician! If you’re looking for one of the most unusual opportunities for pure, motivational entertainment at your company event, please consider being amazed by a blind keynoter and magician - Amazing Jeffo! 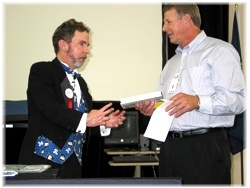 Successfully performing magic for 20 years, encompassing 3000 shows, including numerous corporate, non-profit, and governmental agency events. His keynote "Encouraging the Dream" spurs participants to challenge their perceptions of the capabilities of others as well as their own. His personal insight will inspire your audience to adopt their own "Can Do" philosophy and recognize that challenges are powerful opportunities for personal development. Jeff’s story of the encouragers in his life as agents of transformation will empower your participants to let go of self-defeating attitudes and soar to the height of their capabilities. This enlightening, motivational presentation, by none other than a blind magician, will ignite your employees to pursue challenges in a new light. The comedy filled presentation weaves a message throughout the show that reflects a belief that the most disabling thing in our lives is the thing we can do the most about: our attitude. The magic illustrates that one need not possess sight to have vision. Amazing Jeffo’s magical routines are filled with magic, music, stunts, harmonica playing, volunteer participation, sound effects, humor and more. It engages all and leaves your guests wanting more! 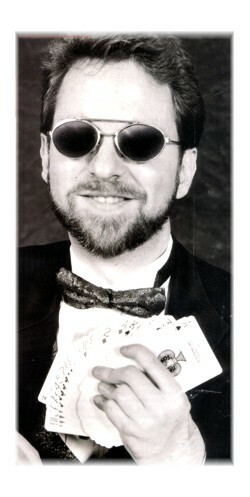 Consider the irony and humor of a blind magician bamboozling your audience! An inspiring and entertaining presentation. Best of all, budget friendly fees! Often faced with long hours, turn-on-a-dime projects and daily work stresses, even the most motivated employees can require an attitude transformation. For 15 years the Amazing Jeffo has ignited employees attitudes with new fire, delivering an original show that combines magic, music and comedy to embolden employees to seize on their talents, experiences and opportunities. Blind since his teens, the Amazing Jeffo has risen above his life's circumstances to inspire others to do the same. 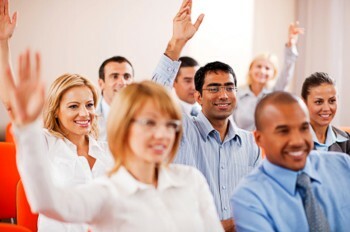 An Audience-Involving, Fast-Paced Program That’s Bound to Lift Spirits! Out of his hat, Amazing Jeffo pulls extraordinary surprises sure to mesmerize any audience. Amazing Jeffo is not your typical magician. He's blind! He shares his hilarious view on life by using a smart-aleck shtick about his blindness to demonstrate that attitude can overcome any obstacle. His ORIGINAL act blends magic, music and comedy to guarantee your company an eye-opening experience they'll never forget. He’s mystifying, offbeat, even outrageous, but always leaves his audiences with a sense of childlike wonderment. Rising above life’s circumstances, The Amazing Jeffo defies the odds and makes a living from magic, teaching employees to enjoy, rather than fear, the unexpected. He motivates others to higher achievement. "The Amazing Jeffo provides proof positive that a sense of humor and a sense of self-worth can more than make up for the loss of the sense of vision. Kris Kramer of Welsh Companies says "Great rapport with his audience, blending fun with education. Wonderful audience response." For many of us, the magical part of his act wasn’t the tricks and the gags. It was watching him perform so effortlessly and easily. His warmth and sense of humor help underscore the real message: You can overcome adversity and make significant contributions to your self and your community." The Amazing Jeffo helps employees look at problems in a new light and gives them new ways of seeing solutions. He inspires others to better their workplace performance. Through his witty view of life, The Amazing Jeffo conveys the importance of being able to laugh at yourself. His performance helps people relax and boosts morale. Jeff’s natural adaptability and creativity enables him to blend any special topics you may have into the show to complement the principles and goals of your organization. Jeffo can develop comedy bitts that play off of various personalities in your company, sure to create conversation around the water cooler the next day, giving everyone a sense of camaraderie. For social hour or networking events, Amazing Jeffo goes table to table or works through the crowd with his magic and comedy. His interactive style will delight participants at your event and give them a real sense of belonging within your organization. Enclosed is a check for an additional tip to show my appreciation for making our company picnic a huge success. You far exceeded my expectations in presenting a show that was entertaining for all ages. "The humor you brought into the show was great. 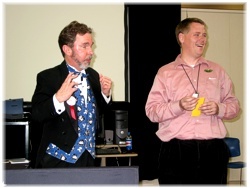 The way you involved the audience made it especially fun and of course the magic tricks were amazing for all ages."